Founders of KFWH present at the White House! 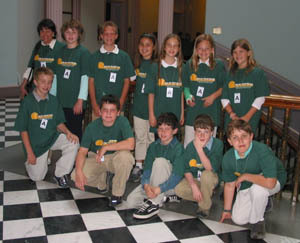 Kids for World Health was founded by our class of 18 students at Chatsworth Avenue School in Larchmont, New York. We were only in third grade then, but we had strong ideas. Now in colleges and universities, 15 of us are still together continuing our work and supporting the organization as it grows. Click here for a KFWH timeline of our history. KFWH was born in our classroom during a study of Africa in the year 2001. As part of our study, we took a “virtual trip” there to do research on African countries. Through a friend who was touring the continent, we were able to make direct contact with one of the most traditional tribes in Africa called the Himba who live in Namibia. During class discussions, we talked about how we share life and humanity and how we could share with a culture so vastly different than our own. Amazingly, we were invited to be the first group in the western world to communicate with the tribe’s “learners” or students! During this same time our classmate, Sam, brought in a CBS, “60 Minutes” film on Sleeping Sickness that described the plight of thousands of people who die each year in sub-saharan Africa. We were ready to view the film and to discuss the issues. Our class reacted strongly to this film, and although we could hear both sides of the argument, we felt that the western world needed to react more compassionately to families in developing countries who did not have access to the medicines that they desperately needed to survive. Our feeling that “Life is important to all people, rich or poor” became the motto for our organization. Our group of 18 went to work to discuss what we could do. We wrote many letters to pharmaceutical companies, contacted the UN and the World Health Organization,and studied the research and materials from Doctors Without Borders. We met with the CEO of Bristol Meyers Squibb, and were invited to Washington, DC with Doctors Without Borders to lobby for access to drugs for developing countries. During our stay in Washington, we had the honor of presenting the Doctors Without Borders Access to Medicines Campaign petition to the White House on behalf of the country’s youth. In addition, our group had meetings with Senator Hillary Clinton, Congresswomen Jan Schakowsky and Nita Lowey, who gave support to our mission. As our work continued, we made the decision to form a not-for-profit organization called Kids for World Health to help strengthen our efforts and to include other students and community members in our mission. We worked hours on the policies and the structure of the organization, brainstorming ideas each week during lunch. Dr. Jean Jannin from WHO and other world-renowned experts and doctors in the field, came to join us on a panel about neglected diseases. It was an amazing and memorable evening for everyone in our community! With the support of Dr. Jannin, Coordinator of Tropical Neglected Diseases at the World Health Organization and his team, we were able to immediately direct funds to a health clinic in Africa that works to control and to eliminate Sleeping Sickness. The students and the community were thrilled to effect such positive and visible change in our targeted village. Since those early years, we have raised over $200,000 and used those funds to create KFWH Treatment Centres in six locations in Africa. We have expanded our Objective to include Buruli Ulcer, Chagas Disease, and Leishmaniasis. We have raised over $5000 to fund our Outreach and Educational efforts and these have offered us private meetings with politicians, such as former Senator and Secretary of State, Hillary Clinton and First Lady Laura Bush, as well as inspired new EXPO and educational events. We are growing each year to include other students in chapters across the U.S and the world. We believe that together we can make a difference in the lives of kids and their families in our world! We need your voice to join ours so that we can continue to find ways to carry out the mission of bringing awareness of neglected diseases to others and to find ways of saving lives!